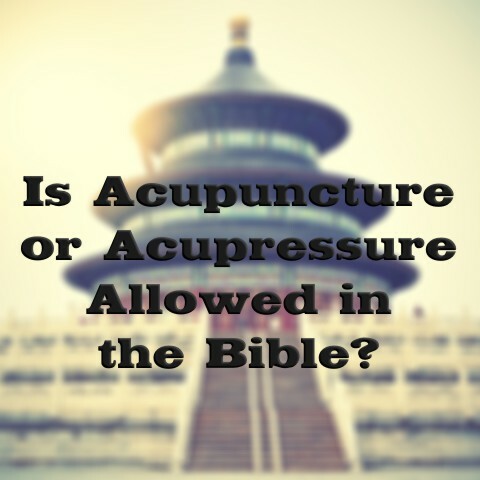 Is Acupuncture Or Acupressure Allowed In The Bible? Is acupuncture or acupressure sin for the believer? Does the Bible forbid such practices? Acupuncture is an ancient Chinese medicine technique, which is sometimes called alternative medicine, and is where they insert needles in various parts of the body. Where they insert the needles depends on where you are hurting or what type of treatment you are seeking. The studies that have been done on acupuncture are mixed at best, and there has never really been any clear and convincing evidence that it actually works. Some people do testify that it works for them, but a greater number of people say that it hasn’t made any difference for them, and if it does, it’s only temporary because you can’t leave the office with all those needles sticking out of you, can you? Acupuncture, called traditional Chinese medicine, is primarily used for pain relief, and although other uses have been found, the studies have had mixed results at best and are inconclusive in showing its benefits, especially long term benefits, and as I said, it has highly inconsistent results regarding the treatment of pain. Problematic areas include needles hitting nerve endings, blood vessels, and needles that have not been sterilized being reused which has caused infections in the patients. Acupuncture and Acupressure are ancient Chinese medicine techniques, which are sometimes called alternative medicine. Acupressure is also an alternative medicine, but this is associated with the concept of energy flowing through the “meridians” or the channels of the body in which energies can travel and be focused on certain areas. A few studies have indicated that acupressure helps those who have nausea or are experiencing vomiting, and some claim that acupressure has been effective for headaches, muscle tension, lower back pain, stomach aches, and a number of other ailments, but the results are so varied that it’s hard to prove conclusively that acupressure helps. Even if acupressure or acupuncture helps, it is only temporary and treatment is needed on an ongoing basis, so acupressure and acupuncture, even if they do help, don’t have lasting value and they do not solve the root of the problem. If anything, it’s like putting a band aid on an infection, but not treating the infection. And, acupressure practitioners are inconsistent in their treatments, and at best, it’s about as effective as the placebo effect. There are some very good eastern medicines that have been used over the centuries to treat a variety of ailments and illnesses, but there is something more to these ancient Chinese techniques than we might think. It is the source of these treatments that is troubling. It originated from eastern mysticism and trying to exist in harmony with the Tao, or the life-force, and is closely associated with Hsuan Chaio, a popular Chinese religion that’s based upon a pantheon of many gods and not the One, True God, therefore, it consists of taboos, superstition, alchemy, and even divination, which the Bible strictly forbids. Besides, if it is not from God, guess what, it must be from Satan because whatever is not of God is not good. Their philosophical teachings are based upon yin and yang, with the yin being the darkness and having a feminine side and the yang, which is the masculine side and refers to light. The yin is negative and the yang is positive, and when the two are balanced, there is supposed to be harmony and enlightenment, whatever that means. These two are designed to put the “Tao” into a balance or in harmony with nature. It all sounds too mysterious to be biblical. Some have reported good results from acupressure and acupuncture, but everything that lies at the root of these practices is anything but biblical, and again, any real lasting effects are typically not found, and are most often no more than having a placebo. When acupressure or acupuncture is applied, the practitioner looks for “points” or places on the body where they can access the “chi” that is blocked or doesn’t flow the way it’s supposed to, but what is the “chi?” Chi (qi) is that which gives life and in terms of the body. Chi is that which differentiates a corpse from a live human being, so chi is a strong life force that makes a human being totally alive, and both traditional Chinese medicine and acupuncture are based on balancing and enhancing the chi to bring the body into a state of harmony, balance, and health. My problem with chi and with acupressure and acupuncture is not the results, but the source from which it comes. They falsely claim that chi makes it more possible for us to personally enter into higher states of consciousness, which lie at the heart of religious experience, so when this happens a person opens themselves up to all sorts of hosts, like demons for example. They emphasize the patient having an open mind, but the problem with open minds is that they need to be shut. We don’t go to bed at night and leave our doors and windows open, because just about anyone can come in, so an open mind can leave openings for just about anything or anyone to enter in. The open mind can open up a person to evil spirits because when they see an open mind, they see an open invitation to come in and live. I think it’s not even a gray area to me to receive acupressure or acupuncture, unless there is absolutely no connection with the eastern religious beliefs, but even this doesn’t seem to be worth the risk. Even if it does help some, aren’t the risks heavily outweighing any benefits? I don’t think it’s worth it, myself, so I would suggest you use caution when trying to receive acupressure or acupuncture treatments, because the source is not of God and if it’s not from God, then we know who it’s from, and we don’t want to risk opening ourselves up to wicked spirits in high places (Eph 6:12). It just doesn’t seem to be worth the risk. Something more for you to read: Why are Eastern Religious Practices so Popular Today? Resources – Scripture quotations are from The Holy Bible, English Standard Version® (ESV®), Crossway Bibles. (2007). ESV: Study Bible : English standard version. Wheaton, Ill: Crossway Bibles. Used by permission. All rights reserved. Ernst, Edzard (2009). “Acupuncture: What Does the Most Reliable Evidence Tell Us?” Journal of Pain and Symptom Management. 37 (4): 709–714. Stephen Barrett, M.D. (March 9, 2006). “Massage Therapy: Riddled with Quackery.” Quackwatch. Modern western medicine and vaccinations are far worse. Western doctors can be some of the most hypocritical, corrupt, non-caring “healers” in the world. Thank you Patrick and yes, many are hypocrites but I don’t think the majority are. I do agree, there should be more compassion with some doctors, but not all are this way. Previous post: What Is A “Seared Conscience”?